The Texas Rangers finally succeeded in eliminating gambling at Galveston’s famed Balinese Room in 1957, but it took a Category 2 hurricane to cashier the old casino-on-a-pier once and for all. Coming ashore on Galveston Island in the predawn hours of Sept. 13, Hurricane Ike pushed a towering storm surge that beat the Balinese Room worse than a guy betting a full house against a straight flush. 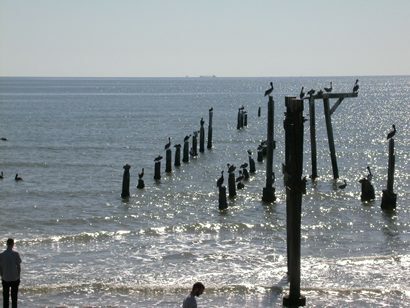 When the sun came up on Sept. 13 all that remained of the 79-year-old National Historic Landmark were the pilings that once supported a pier that extended 600 feet into the Gulf and a pile of debris that included the old joint’s famous red door. Oh, one other thing survived, at least in the early days following the storm – the club’s Web site. Visiting www.balineseroom.net less than 24 hours after the club’s destruction was almost as painful as listening to a dead friend’s voice on their not-yet-erased answering machine message. Hopefully, the club’s latest owner has managed to salvage some artifacts from the ruins and has deep enough pockets to rebuild the place. But it won’t be the actual structure that hosted some of America’s biggest entertainers, from Bob Hope to Chairman of the Board Frank Sinatra. The club’s history goes back to 1923 when a small restaurant not-so-uniquely known as the Chop Suey opened at 21st Street and Seawall. Though shut down for a time for illegal gambling, it reopened after Sam and Rosario Maceo – Italian immigrants who went from barbering to bootlegging – used some of their illicit income to purchase it. They called it the Sui Jen and offered Chinese food and a night club. Oh, and wide-open gambling. By this time, the early 1930s, many Texans and out-of-state visitors came to Galveston to brace themselves with illegal booze and a little partying in the face of a financial crisis first referred to in the newspapers and magazines as “the Emergency.” Soon it came to be called the Depression, and later, the Great Depression. Indeed, the Sui Jen and other places owned by the Maceos, including the Turf Club, helped Galveston fare better than many cities as the Emergency dragged on. Early in World War II, with Galveston swarming with soldiers, airmen and sailors, the Maceos decided to go with a more tropical sounding name – the Balinese Room. They remodeled the place and lengthened what had been a 200-foot pier by 400 feet. At the end of the pier, 200 yards out into the Gulf of Mexico, they built a sophisticated gaming room. The photo shows the Seawall looking east from 25th Street. The first pier...the big wide one is Murdock's. It was the oldest one on the island, and it, too, was totally destroyed by Ike. The second pier, the long one, is the Balinese Room. In was across from the Galvez Hotel. This photo is rather rare since it also has in it the famous Mountain Speedway roller coaster. The Mountain Speedway was made totally of wood. It was destroyed by Hurricane Carla in 1962. Of course, 600 feet was still well inside U.S. territorial waters, but the Maceos seemed to think the room lay far enough at sea for them to run a casino just as if it were legal to do so. Galveston had always seen itself as independent from the rest of Texas and no one minded particularly that the club had been a speak-easy and gambling joint for most of its existence. The Maceos stimulated the local economy. When someone asked long-time Galveston County Sheriff Frank Biaggne why he didn’t shutter the Balinese Room, he famously replied that it was a private club and he was not a member. Using the business model later perfected in a then-small Nevada town called Las Vegas, the Maceos brought in the biggest names in entertainment during the club’s heyday. The list of men and women who appeared at the club reads like an entertainment industry’s Who’s Who. Listed alphabetically, some of those who had gigs at the Balinese Room included Gene Autry, Jack Benny, George Burns and Gracie Allen, Duke Ellington, Phil Harris, Guy Lombardo, Groucho Marx and Mel Torme. Usually, when the men in the big hats showed up at the red door, the Balinese’s house band struck up a rousing version of “The Eyes of Texas” to alert the staff in the back that the Rangers had arrived. By the time the lawmen got to the gaming room, no evidence of gambling could be found. 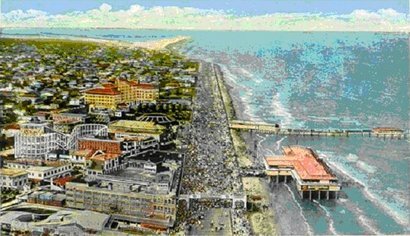 In 1957, newly elected state Attorney General Will Wilson, who as a district attorney had cleaned up gambling and vice in Dallas, turned his attention to the so-called Free State of Galveston. “Shocked, shocked…” he employed undercover operatives to penetrate the club and later, after someone tipped off the Balinese that the Rangers were planning a big raid, used civil injunctions to still the slots and stop the roulette wheels. Even so, the process took longer than most people realize. Up to the early ‘60s, Rangers still occasionally showed up to make sure the lid on Galveston gaming stayed down. But for all practical purposes, the party – at least the illegal version – was over by the spring of 1957. The Maceos had died a few years earlier and the club closed. Variously someone would reopen the place as a shell shop or eatery, but the magic was long gone. The old club got roughed up by Hurricane Carla in 1961 and again by Alicia in 1983, but the structure proved as durable as a geriatric slot machine addict. Listed on the National Register of Historic Places in 1997, the Balinese Room sat empty for a time before Houston lawyer Scott Arnold took a 60-year lease on the place in 2001. He reopened it as a live entertainment venue – sans gambling. Whether he will rebuild the Balinese and roll the figurative dice one more time remains to be seen.